Last week I enjoyed a mini-vacation. We didn’t have a market on Easter Sunday and I did as I pleased. A little bit of this, a little bit of that. None of this and definitely none of that. No commitments. No lists. And no blogging. Just relaxing, catching up on a few tasks I had procrastinated on for long enough and waited patiently for the holiday weekend celebration to begin. Easter has always been a casual holiday for me. Growing up, our standard Easter menu consisted of ham, potato salad, baked beans, deviled eggs, maybe a few other things and always a dessert featuring strawberries–shortcake, angel food cake or the like. 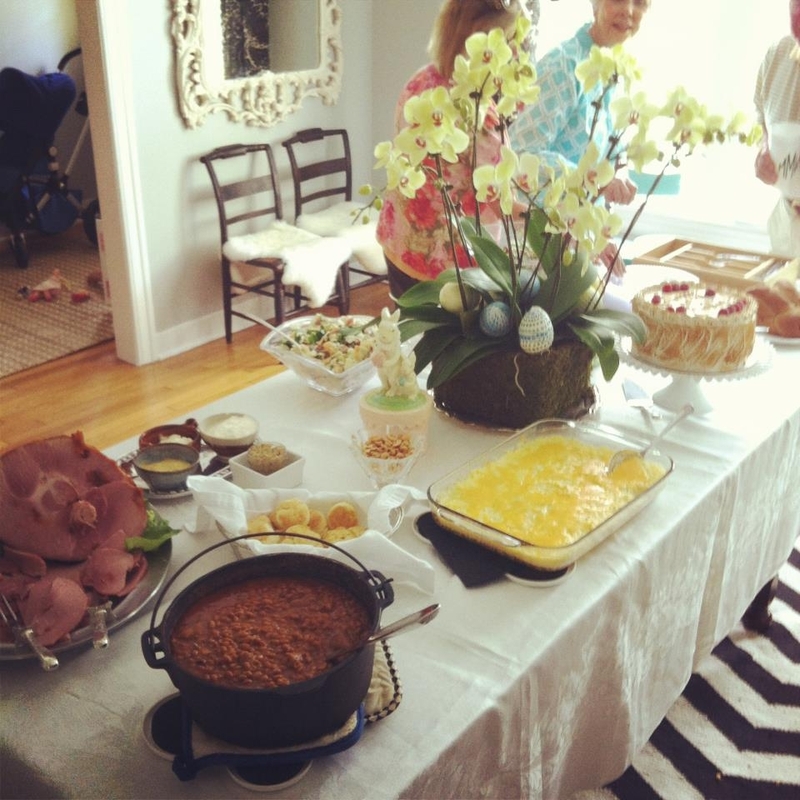 You can imagine my delight when I found out that the menu at this year’s celebration at my cousin’s new house was going to be just like it was when I was a kid–ham, potato salad and deviled eggs. Because the baked beans take six hours to cook and because nearly everything that takes a long time to cook is better the next day, I soaked the navy beans Friday night and made them on Saturday. The aroma that filled the house was unbelievable. It was as if VanCamp’s had taken over my kitchen. We knew just by the smell that these beans were going to be a hit! When David finally tasted the beans, he named me “an honorary New Englander” which he can do because he grew up in Massachusetts and Vermont. The next time you are craving baked beans, do yourself a favor and make them from scratch. All you really need is a little time. Your family will flip and you can be the honorary New Englander in your family. When I think of baked beans, I think of opening a can and "doctoring it up," just as I watched my mother do time and time again. But this year, I decided to change things up a bit and make baked beans. That's right. You start with navy beans, add some ingredients and bake for six hours. Let them meld overnight in the fridge for utter perfection, reheat, serve and let the compliments roll in while you smile and feel the love. Once you have had the real deal, there's no going back to the canned version. You can either soak the beans overnight, which is my preferred method, or quick boil them. For a quick boil, bring the beans and 10 cups of water to a boil in a 4-qt. pot over high heat and cook for 2 minutes. Remove from the heat, cover the pot with a lid and let the beans sit for 1 1/2 hours. If you soak overnight or quick soak, drain the beans in a colander and discard the cooking or soaking liquid. Heat the oven to 250 degrees. Stud the onions with the cloves and place in the center of a 4-qt. Dutch oven, such as a cast iron one. Add the beans, bacon, maple syrup, dry mustard and 3 cups of boiling water. Stir to combine. Cover pot with a lid and place in the oven to cook for 3 hours. Once an hour, lift the lid and stir. After 3 hours, add in the ketchup and vinegar and stir well to combine. Put back in the oven, with the lid on, and continue to cook for another 3 hours. Again, once an hour, stir the beans. The beans are ready when they are tender and the liquid has reduced to a thick glaze. Then you'll want to stir in the rum and season with salt and pepper. Because beans are always better the next day, I let my beans cool and then put them in the fridge overnight. The next day, I put the pot of beans in a 400 degree oven for 45 minutes and then served them to rave reviews, oohs and ahhs.